Coni-Snap® Sigma Series capsules, the world’s most reliable two-piece hard gelatin capsules. Coni-Snap hard gelatin capsules (HGCs) have been a product of choice for Biopharmaceuticals and Consumer Health Care companies due to their reliable, outstanding performance - since their unique locking closure was introduced. They are the most widely used capsule in the world for many reasons but key to their success is the fact they were designed and engineered to perform. Quality by Design (QbD) initiatives have become a new priority in Biopharmaceutical manufacturing as companies are caught between heightened regulatory scrutiny and the demand for greater operational efficiency. The key principle of QbD is to build more robust and tighter process capabilities with reduced variation—to build the quality into the product and the processes in order to reduce reject rates. In 2013, Capsugel launched the first stage in a paradigm shift for quality in capsules with the introduction of Coni-Snap Sigma Series capsules. 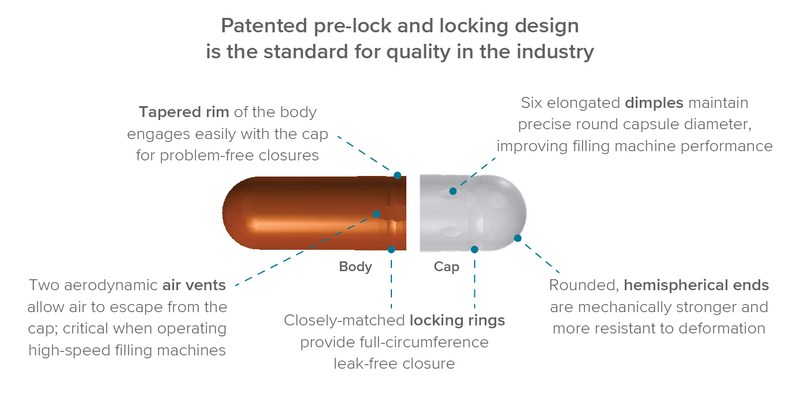 Sigma Series capsules is the designation given to all capsules manufactured to sigma quality standards—with quality measured to a parts per million (PPM) level instead of the industry standard Acceptable Quality Levels (AQL) percentages. All Capsugel capsules—printed and unprinted—will be the product of this unparalleled increase in quality standards as this implementation schedule rolls out across all products and around the world through 2016 and 2017. Coni-Snap capsules are available in 12 sizes and can be customized in a wide range of colors and with printing. Visit Build Your Own Capsule to see more. Coni-Snap capsules are also available in a convenient Capsule Caddy™ container, perfect for clinical trial batches, R&D projects or small manufacturing runs. Interested in learning more about Coni-Snap® Sigma Series? Capsugel has an expert team of quality and technical service engineers who work with manufacturers all over the world to help improve their operational efficiency. Capsugel is committed to providing full manufacturing support - including onsite problem resolution - for our capsule products and equipment. The perfect size container for clinical trial batches, R&D projects, or small manufacturing runs. Capsugel® Vcaps® Plus capsules: The Gold Standard in HPMC. An immediate release capsule for pharmaceutical products in HPMC-only, without gelling agents. Capsugel® Vcaps® Plus capsules offer excellent dissolution profile with pH-independent performance, low moisture content, great machinability, and visual quality. Our Technology Selection process, which includes predictive modeling and technology mapping, allows Capsugel Dosage Form Solutions scientists to quickly identify the right solution for improving bioavailability and formulating a robust, fit-for-purpose dosage form. ​Capsugel® Colorista™ technology can provide a shorter development time for your product, while offering flexibility to progress with technical development before the final commercial color decision is taken.